A truly luxury self-catering resort, Ocean Two is located on the beautiful south coast of Barbados and has access to an isolated bay. With full housekeeping, a front desk and access to concierge services, this resort is self-catering with a difference. Stunning views of the sea and across the bay, the 88 rooms offer guests either one or two bedroom configurations. Contemporary furnishings and designs mean your holiday is set to the tune of idyllic Caribbean surroundings. A private cove and bay means you can swim in peace and enjoy the beach and its surroundings as you wish, or if you prefer you can venture out into the warm waters and take full advantage of the excellent snorkelling opportunities and be able to explore the marine life of the Atlantic. For those seeking a fitness buzz, there is a fully-equipped gym with an assortment of cardio machines and resistant equipment and weights. There is also a kids club operating during the holidays with a great program with emphasis on arts and crafts. A stunning self-catering style experience is waiting for you at Ocean Two, with water sports on offer, restaurants, bars and a great atmosphere in this beautiful part of the Caribbean. All room types feature a flat screen cable TV and DVD player in the bedrooms and living area, air conditioning throughout as well as fans, ipod docks, telephone and WiFi access and a safe. Hotel Room (Maximum Occupancy: 2 Adults) – Standard hotel rooms, each with a king size bed and balcony with a partial ocean view. One Bedroom Ocean Front Suite (Maximum Occupancy: 3 Adults or 2 Adults/2 Children) – Suites of this category have a king size bed and a pull out sofa bed. There is spacious living room and dining room with space at the table for 4, as well as a full kitchen with oven/stove, refrigerator and washer/dryer. Two Bedroom Ocean Front Suite (Maximum Occupancy: 5 Adults or 4 Adults/2 Children or 2 Adults/4 Children) – These suites feature a master bedroom with a king size bed, balcony with a partial ocean view and full en-suite bathroom. The second bedroom also has a king size bed with partial ocean views from the windows. There is also a second bathroom. A large living area with sofa bed forms part of the suite, as well as dining room with space for 6 and a full kitchen with oven/stove, refrigerator and washer/dryer. Two Bedroom Bay View Suite (Maximum Occupancy: 5 Adults or 4 Adults/2 Children or 2 Adults/4 Children) – The very highest in luxury, these suites have a master bedroom with king size bed, balcony with partial ocean views and full en-suite complete with soaker tub. The second bedroom also has a king size bed and partial ocean views from the windows. There is also a second bathroom. The spacious living area has a pull out sofa bed, with the adjoining dining room seating 6. The full kitchen has an oven/stove, refrigerator and washer/dryer. Taste – Serving breakfast, lunch and dinner and sat looking over the pool, the cuisine is a delicious selection of international and Caribbean dishes. Pastas, salads, sandwiches and grilled items are available as well as a host of other delights. Cocktails and an array of other drinks can be had from the comfort and cooling waters of the pool at the swim-up bar, as well as snacks throughout the day. The Oasis Lounge – Ideal for a sunset cocktail, or indeed at any other part of the day, it features a bar and snack service during the afternoon and into the evening offering a wide range of drinks and food options. Room service is available in the resort as well, and a grocery delivery option is also on offer if you wish. Or if you fancy eating out the resort is close to the popular St Lawrence Gap area, with a range of restaurants and bars. 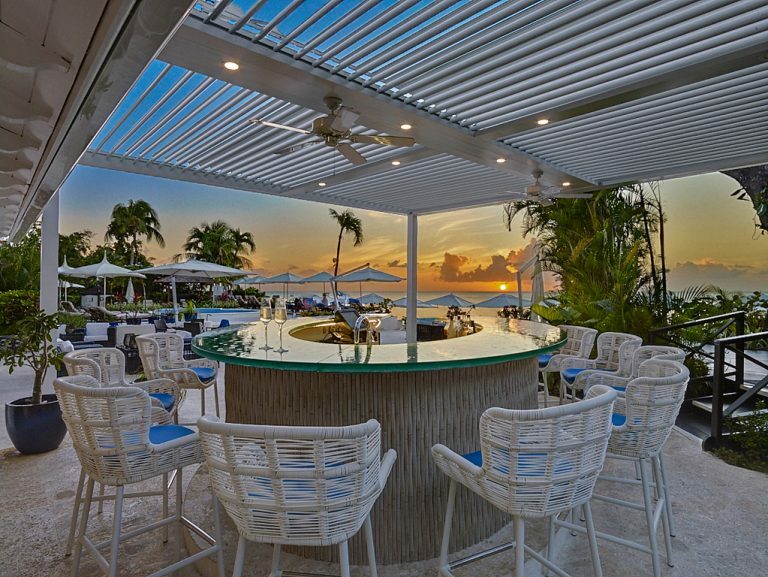 An all-suite and all-inclusive resort, Turtle Beach is sat on Barbados’ south coast with a beautiful stretch of white sandy beach at its doorstep. With excellent links to the airport, Bridgetown and a stone’s throw from the lively and vibrant St Lawrence Gap and its buzzing nightlife, this resort has everything you could possible want.